JOANN SWANSON, WHERE HAVE YOU BEEN? Do we all remember Joann Swanson!!?? Love her stuff in the old "Nutshell News" I have the old magazines and won't get rid of them, they are the miniaturist's bible, (no blasphemy intended). Well, I was Googling around and found that she's on blogspot!! Go over there and have some FUN!! Tell her I said "Hi". I've never met her, but she's my HERO!! Hello . . .I used to put the metric measurements in the tutorials. To tell you the truth I've gotten lazy because of time. I am sorry to short change you. I did go to the Google page and click the Images tab and type "conversion chart inches millimeters and found many to choose from that you could print out. There is even a picture of an inches ruler compared to a metric ruler. I do apologize for the inconvenience. GARDEN BASKET TUTORIAL - HOW TO MAKE A 1 INCH SCALE GARDEN BASKET WITH CARD STOCK. Hi everyone. This month I made a Garden Hod, that's what the catalog called it. I made the first one by scaling the full-size measurements down to 1 inch scale. It was far too big, I think you would be making clay vegetables forever trying fill it up. I made another, smaller this time for your vegetables and flowers. The watering can is from January of 2011, How to make a mini watering can. It's in the index at the left of the blog and it's in 5 parts. Keep your pencil sharp and use a new blade in your craft knife. I used yellow carpenter's glue for gluing. Cut a rectangle of card stock to draw on. 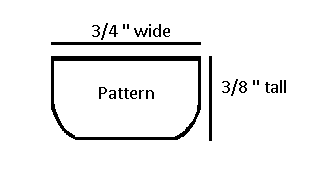 Draw a rectangle 1-1/8" x 1-7/16"
Measure in from the original rectangle 1/16" and draw a new rectangle inside the one you have all ready drawn. Use your ruler to measure and mark at 1/16" intervals on the long side of your rectangle. We are drawing the "spokes" of the basket. When you have all the marks made use your ruler to draw line to connect the marks. In this picture I have darkened in every other space past the frame. We are going cut these out with a craft knife. I've got all of the lines drawn. You should have 10 spokes that are not darkened, not counting the frame. Use your ruler or a steel straight edge to guide your craft knife while you cut out the darkened spaces. Be careful, don't cut into your frame. Cut from card stock at least 9 strips, 1/16" wide. I did this by eye, it's not too important to measure these, they just need to be thin. These are our weavers. Start weaving, over the frame, under the first spoke, over , under. Tweezers help getting the weavers between the spokes. Begin the next row doing the opposite, under the frame, over the first spoke, under, over and so on. Glue the ends of the weavers to the frame, be sure to turn the weaving over and glue the weavers on the back side. With a straight edge and your craft knife cut the woven mat away from the rest of the card stock. This is the pattern for the ends of the garden hod or basket. Copy it to a program that you can change sizes in. I have listed the size the pattern should be. Of course, you could also draw this with a ruler and round off the corners. When you have your pattern made trace it onto mat board. Please, be careful and use a piece of mat board large enough you can grasp and move around without getting your fingers too close to the blade. One cut out, another one to do. Dry fit the woven mat to the ends. The long edge will be glued to the ends. We are going to glue a strip to the top edge so if your woven mat is short this will be covered. Measure and mark the middle of the ends. Measure down from the top an 1/8" and mark. Drill a hole at the mark you made. Right now it doesn't matter the size of bit. A "Q"-Tip is used for the handle. Cut the cotton ends off. The "Q"-Tip needs to be thinner. Use sand paper to open the seam. I start sanding back and forth while the sand paper is wrapped around the stick. When I get a little bit started I then know where the seam is and can sand there and open up the rest of the seam. I've got the seam open. Peel the paper away until you have about 1/16" in diameter. Cut the extra paper away and glue the seam down. Find a drill bit that's the same diameter as your stick. Set the stick aside for now. Drill into the end, at the hole you drilled before, with the bit pointing up at an angle. The side of the end that you started your drill bit in is the outside of the basket. Glue the long edge of the woven mat to the rounded edge of the end. Remember, the outside of the end is the side that has the lower hole. The woven mat should fit, but if it doesn't a strip is added to the top of the basket. Both ends have been glued on. Cut the stick to 1-5/8" long. To make inserting the stick/handle into the hole I've sanded the tip a bit. Slip the end of the handle into the hole in one end of the basket. You will have to slide the handle through a bit to get the other side of the handle into it's hole. When you are satisfied with the position, glue the handle in. You can shape the handle more after it's glued into the basket. If any of the handle is protruding you can sand or cut it off. Cut a strip of card stock to fit over the top of the frame of the woven mat covering up the ends of the weavers. I painted my garden hod with Delta's Burnt Sienna, then applied a wash of black. I added lots of water to the black and brushed it on and dabbed off. I then sprayed a coat of clear satin finish on. I added some vegetables I made a long time ago. I think my tomatoes look awful big compared to those tiny ears of corn! Have fun trying this out, our little people should be getting out to start their gardens and they need a basket! Have fun, expand on it, make it better . . . . . I check the blog every few days to see if anyone needs help, and please if you need help contact me at kkcompas@yahoo.com, and to read the wonderful comments. I have two big, big thank yous to hand out to my followers. First, looky, looky, I've reached 1001 followers, how cool is that!? When I began this blog I did not think that I'd be found or anyone would be interested in what I shared. Well, I was wrong. I love all of you. You make me look forward to the middle of the month so I can put away the fabric and get out the paper and glue and make something fun. Second, and this was a big surprise . . . . I received an e-mail from the Google Adsense and they are mailing a check to me!!! Yahoo!! I want to thank everyone that clicks on the Ads on the left side of my blog. You see every time you click on an ad I make a penny or so, I really don't know, it's not much. But it made my day and it helps buying my supplies. I hope this isn't too crass but keep up the good work and I'll keep making minis for you! !